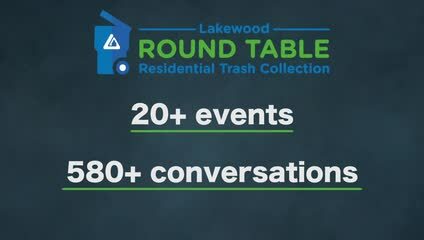 Do you have ideas for improving Lakewood's residential trash and recycling system? CLOSED: We are analyzing all of your ideas now! If you have additional comments, please email sustainability@lakewood.org. Share your ideas here and see if your neighbors agree! Denver has great trash pick up, even compost pick up. I lived with and appreciated it for decades. It's far superior to Lakewood's system. City helps with organization and bidding for those residents who want a single waste hauler; others residents continue as they wish. I like the Golden, Edgewater, and Ft. Collins models; pick your size option and all options come with recycling as a standard service.